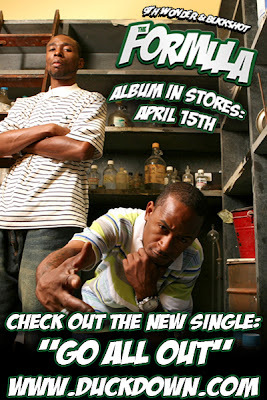 9th Wonder & Buckshot got an album coming out in the Spring. The lead off single entitled Go All Out is a refreshing introduction to an album that drops on April 15th. This track got that "feel good music" feel to it. Ya dig?! The Formula album features appearances by Talib Kweli and Raheem Devaughn. This is an album that you'll wanna keep on your radar when it comes out. For now, press play below to listen and log on to the Duck Down website for more info. If you want to download this track, go to the Duck Down MySpace page and click away on the music player. Hurry before they disable the download function.